The opening of this year's 4th Togart Contemporary Art Award – whose speciality is to feature both Black and white Northern Territory artists – was also the occasion for the opening of a new contemporary art space in Darwin: the Chan Contemporary Art Space. This 330 square metre building is prominently placed between the Supreme Court and the CBD, has been used by the Darwin Art Fair, and has the potential to bring art into the NT public arena more effectively than the suburban, beachside Museum & Art Gallery of the NT could ever do. But will the Chan's take on “Contemporary Art” include challenging curatorial examinations of indigenous art; or is it another way for the Territory government to allocate funds to the more vociferous white population that lives in Darwin? Is it significant that this year's Togart Award contains the smallest number of Aboriginal artists in the selected hang, and was won by a Chips Mackinolty print which seems designed to celebrate less-complicated times in Darwin before the 1967 Referendum? We'll get some sense of answers to those questions later in October when the Chan's administrators tell us what exhibitions have been selected for showing there next year. See more below. In the years since 2007 when the Toga Group started this art award in conjunction with the public art program around its massive Waterfront development in Darwin, about half of artworks selected to hang have been by indigenous artists. Two out of three winners have been Aboriginal too. This year, less than a third of 34 finalists is Aboriginal. Perhaps the art just wasn't there? There's certainly a sense of over-familiarity among many of the Aboriginal selections – though Timothy Cook's bold Kulama image seems to combine both the strong spirituality of the Tiwi yam increase ceremony and confident aesthetics. Also, it strikes me that 5 or 6 of the white artists are showing indigenous tendencies – from Peter Eve's moving Larrikia Embrace photo to Deborah Clarke's clear reference to Aboriginal stencilled body parts on cave walls in her ephemeral image of her own body outlined by desert sands that are being washed away by an incoming tide far, far away from her Red Centre home on the NT coastline. 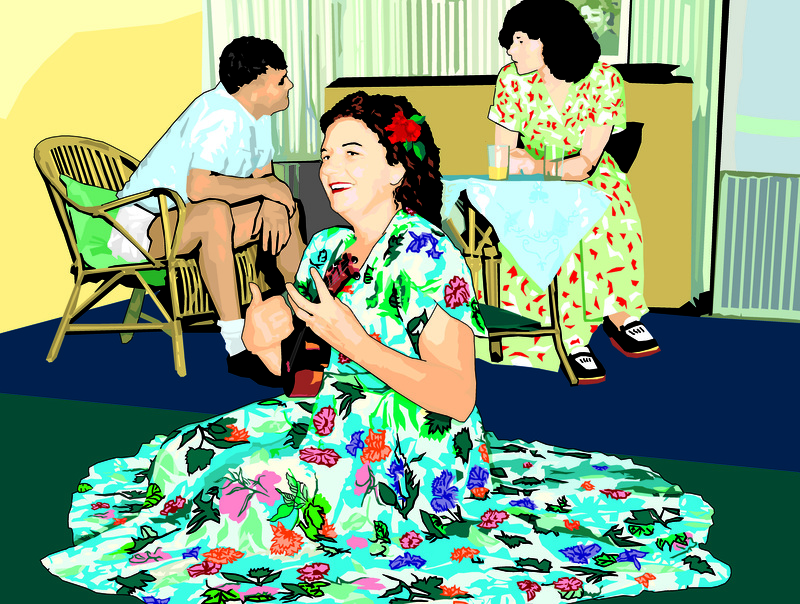 The Mackinolty winner, Neta, Darwin 1950, is all coastline – flower-print dresses, shorts and white socks, flowers in the hair, bamboo furniture, with the sounds of a ukelele in the scented, humid air. A White Man's Dreaming. Darwin as pictured (still?) by two Down South judges – curators from public museums in Melbourne and Perth, who were lacking the participation of a commercial art gallery director judge for the first time this year. It was not exactly chosen to confirm the more academic views of Southern essayist Darren Jorgensen in the Togart catalogue, who saw the Award as “designed to prove that Darwin is not still the primitive frontier, (rather) a centre of cosmopolitan civilisation”, as well as proof that NT artists are “addressing the art world's most pressing concerns”.